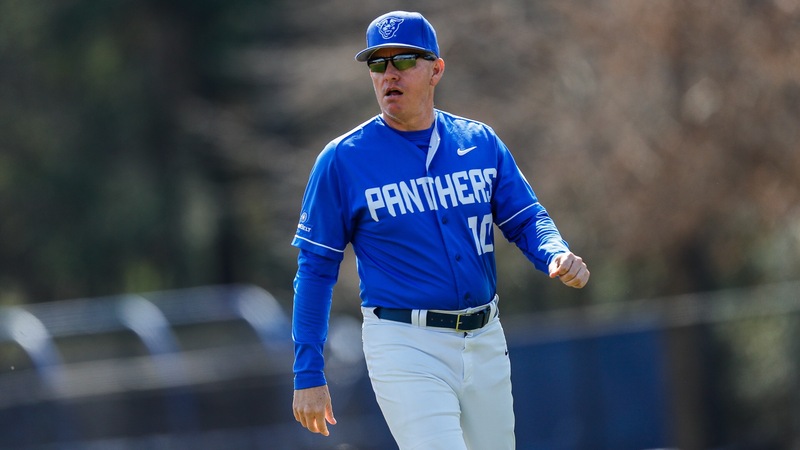 Georgia State’s head baseball coach Greg Frady will go down as one of the best coaches in university history. For Frady, winning seems to come natural, and he has done a lot of it in his coaching career. Frady took the helm for the Georgia State baseball team in 2006, when he was promoted to head coach after being an assistant for the previous two years. His coaching career began back in 1988 when he was an assistant at Columbia State. Since then, he has coached at North Florida Community college and University of Central Florida (UCF). While at UCF, Frady was a part of many incredibly successful teams. During his seven years there, the team ranked in the top 25 every season, won six conference championships and made the NCAA tournament four times. For Frady, the game of baseball has been a teacher for him. It has taught him many invaluable lessons that he can apply to his everyday life. Frady is currently in his 10th season as the Georgia State head coach and he is the all-time winningest coach at the university. During his time as a coach, the Panthers have had six winning seasons and won at least 30 games in each of those six seasons. During the 2009 campaign, the Panthers won a Colonial conference championship and a NCAA tournament berth. He also managed to navigate the team through three conference changes, and each time, it was more difficult as the competition rose and the conferences were ranked higher. Frady is right – players make the world go round. And he has undoubtedly coached excellent players, which explains why it is so difficult for him to name the best player among the ones he has coached. “I’ve had so many really outstanding players, it’s hard to categorize that,” Frady said. Frady coached several major leaguers including Mike Maroth and Drew Butera, who are currently in the big leagues with the Kansas City Royals. Besides his role as the Georgia State baseball coach, Frady was also the coach of the German National team. In 2010, he was named the European coach of the year. Frady won over 100 games in international play while managing the National team. Despite his position there, Georgia State was always his main priority and that is why he was able to balance the two. Frady demands the same excellence from his players in the classroom as he does on the field, and that is one of the many things that makes him such an exceptional coach. He expects nothing less than 3.0 GPA from any of his players. Coach Frady played baseball at Troy State, where he won a national championship in 1986. Frady had more fun being a player than he does being a coach. Frady has over 300 career wins and counting at Georgia State. He was inducted into the 2017 class of the Georgia Dugout Hall of Fame. Frady has learned a lot through the game of baseball and he aims to take what he has learned and pass it onto his players to keep the success progressing.